Despite the increase in total expenses, profit from operations grew by 19% to total $83.3 million, relative to the $69.93 million recorded last year. Finance Costs increased to $2.15 million (2016: $275,000) resulting in profit before tax of $81.15 million, a 19% increase when compared to $69.65 million reported in 2016. Tax charges for the period were $14.28 million relative to $11.92 million for the corresponding period last year. Net Profit attributable to shareholders totaled $66.87 million, relative to the $57.73 million booked for 2016. 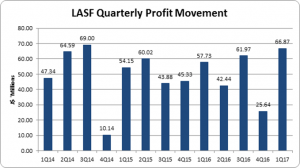 Earnings per share for Lasco Financial Services Limited (LASF) amounted to $0.053 (2016: $0.046). The twelve-month trailing earnings per share amounted to $0.16. The number of shares used in our calculations amounted to 1,242,769,657 units. As at June 31, 2017, the company’s assets totaled $1.54 billion, $270.95 million or 21% more than the $1.27 billion a year ago. Equity attributable to stockholders of the company amounted to $1.22 billion relative to $1.01 billion in 2016. This translates to a book value per share of $0.97 (2016: $0.81).